I decided that Clark hadn't come out to his parents when he left for Metropolis (see prior post). Martha, specifically, begins to suspect Clark is gay (and attracted to Lorry) during "The Green, Green Glow of Home." In "Honeymoon in Metropolis," Lorry is researching gay couples and the Lexor Hotel. Is the hotel accommodating to married gay couples in the honeymoon suite? He was going to ask Clark to pretend to be his “husband” on the story but he is still haunted by the perfume incident (“Pheromone, My Lovely”), especially since he assumes Clark is straight. In fact, Lorry will not learn that Clark is gay until the end of Season 1. Of course, Clark and Lorry end up working together on what turns into the story about the secret underwater weapon. Once they are on surveillance in the hotel suite, Clark and Lorry discover that they get along quite well. As in the original episode, they play cards plus board and trivia games and watch movies. I'm a big believer in figuring out the popular culture preferences of a character. Clark enjoys movies like Babette’s Feast. He enjoys foreign films just as he enjoys foreign travel. And he likes movies with uplifting messages and no super feats. Nope, he's not all that into DC or Marvel! Lorry prefers movies like Brick. 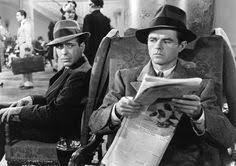 They both enjoy The Maltese Falcon and Casablanca. As in the original episode, Clark’s parents call the hotel during the stake-out. Martha is tickled that Clark and Lorry are together; Jonathan is uncomfortable but accepting. They deliver the line from the original episode: “Is there anything you’d like to tell us?" At the end of the episode, worried that Lorry will interpret the trashing of the hotel room (by the villains, of course) as a “hate crime,” the hotel extends him a complementary stay. In the meantime, Clark calls his parents with a wrap-up. He prevaricates about Lorry but senses his parents suspect the truth. where Jonathan suspects that Martha is cheating on him because she is taking painting classes (and posing in them apparently). He comes to Metropolis to stay with Clark. When Martha shows up to tell Jonathan off, Clark shares his secret with them. "I hope it wasn’t the portrait of your naked mother that did it," Jonathan mutters. And the issue is closed. Coming next: Okay, so what about Lex Luthor and Lorry? How would that story line unwind?